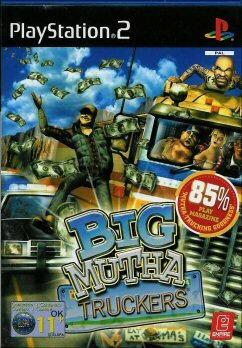 Big Mutha Truckers is the outlandish game of four truckers desperately trying to earn enough money to inherit Ma's fortune when she retires. I must admit to groaning at first when I saw the title, however give it a very short amount of time and you will be hooked! 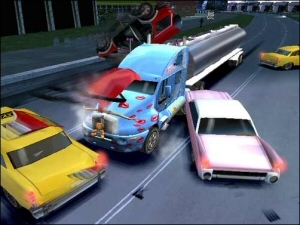 It's surprising that the gameplay is fairly indepth as I was fully expecting something pretty brainless, sort of like 18 Wheeler from Acclaim. Don't get me wrong that title was fun but just didn't have much to it. Big Mutha Truckers has a fair bit to it that will keep players in front of the television for some time. Graphics are of a great quality as these screen shots will attest to. 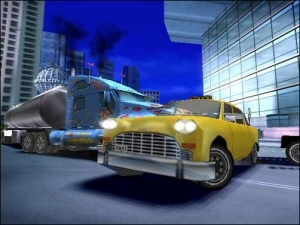 There are many effects that show up on the polished surface of the trucks and also the physics of actually driving one of the behemoths is impressive. The heads up display shows your speed and when to change gears. This is one of the key parts of the game and is pretty realistic in as far as working through the low and high range of gears that a truck has. Getting places quickly and in one piece is the best way to win this game and the company from your brothers greedy clutches. Fortunately the intuitive control system sees to it that you do not have much problem taking charge of your truck and driving around the highways of the county. Of course, driving around like a maniac is going to create some wear and tear on the old truck and it's going to need a fixin'. There are garages all over the place that can repair your truck, quickly and efficiently. However, remember the more you spend on fixing up the truck, the less you have to take home to convince Ma that you are the right trucker to own her company. Most of the music to this title is pretty much redneck stuff, however I enjoyed listening to the chat station and hearing some of the nonsense that happened there. Naturally enough, there isn't anywhere near the amount of dialogue or music that went into Grand Theft Auto: Vice City but it's still a lot of fun to have playing. Trucks and cars have been captured very well, sounding like their real life counterparts. 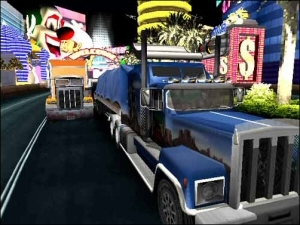 All thing said and done, Big Mutha Truckers is a great deal of fun and well worth your while playing. Truck driving ain't for everyone though and whilst I have scored this a high 85%, I do seriously suggest that maybe this game gets a rent before you pay for the game to keep.